Our Ultimate Euro Trip was coming to an end. 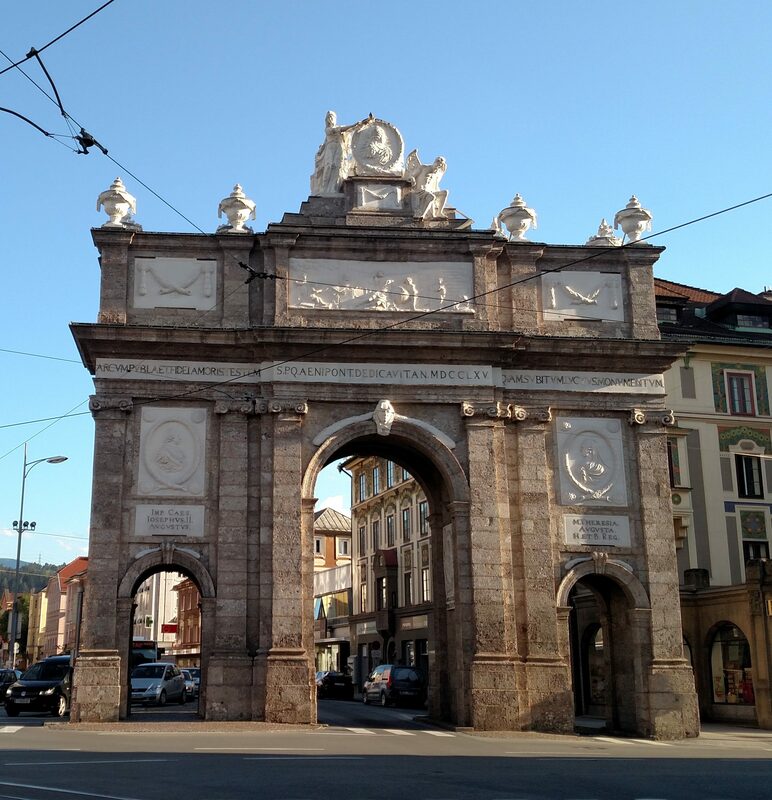 And stopping by the colorful and vibrant city of Baroque-filled architecture Innsbruck was a nice way of ending it with a leisurely stroll enjoying the breathtaking views of the Alps. 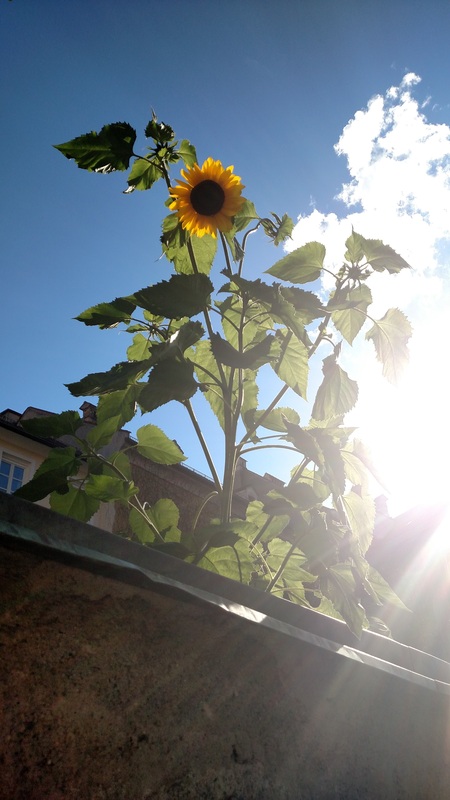 After a quick snap of the sunflower after parking, we made our way to the top of Herzog-Friedrich-Straße and headed east to what eventually turns into Maria-Theresien-Straße for a walk down one of the city’s main streets full of shops and spectacular architecture. First stop in our wander-walking tour…get ready for more architecture like this. 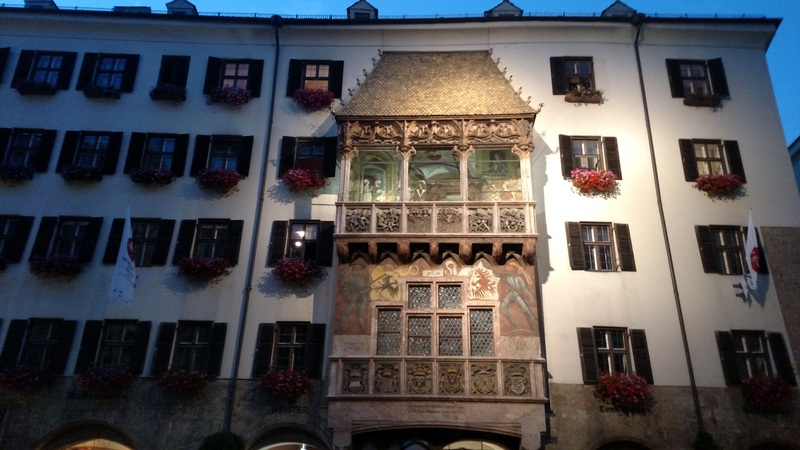 This beauty of a building houses Uhren Wizman, a watch and jewelry shop. Pink Spitalkirche (Spital Church) on Maria-Theresien-Straße. Picturesque view behind us showing St. Anna’s column, the Spital church, and City Tower way down on the right (zoom in?). Can you imagine what this must look like in the winter with the mountains covered in snow? If you can’t, just Google it…It looks Ah-Mazing! 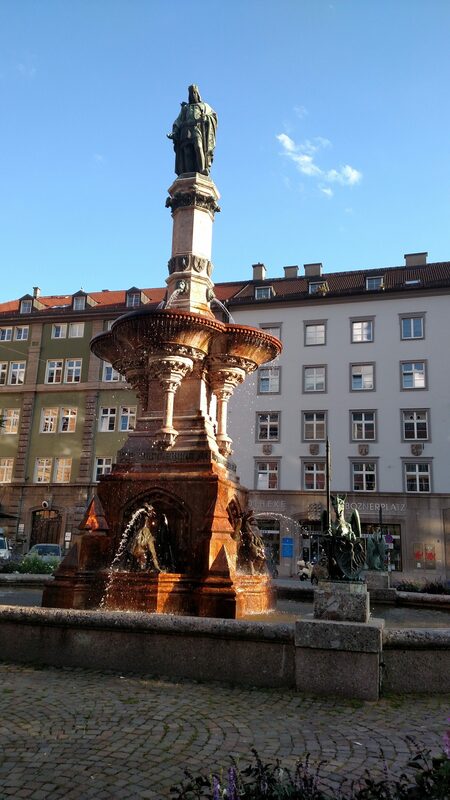 Aimless wandering led us to the Rudolfsbrunnen Fountain in Bozner Platz Square…Can you see the dragon??? Remember Llubljana?? Back where we started on Herzog-Friedrich-Straße. This is the famous Golden Roof building, which also houses a museum. 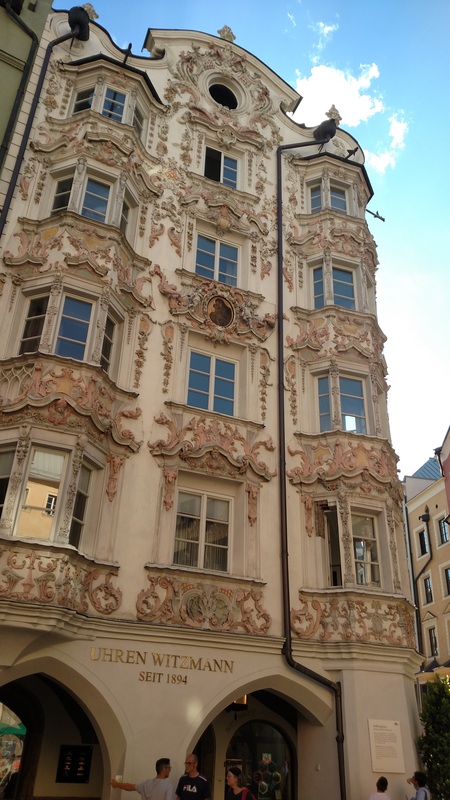 We were told this was the most pictured building in Innsbruck. This night time photo doesn’t do it justice to the way it glows under the sun. 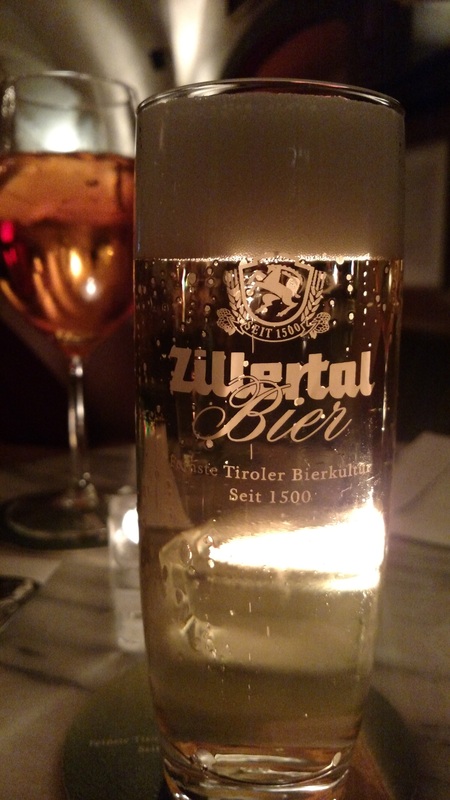 Of course, we could not end the night without a drink…we had a long night of searching for lodging after our accommodation plans fell through. 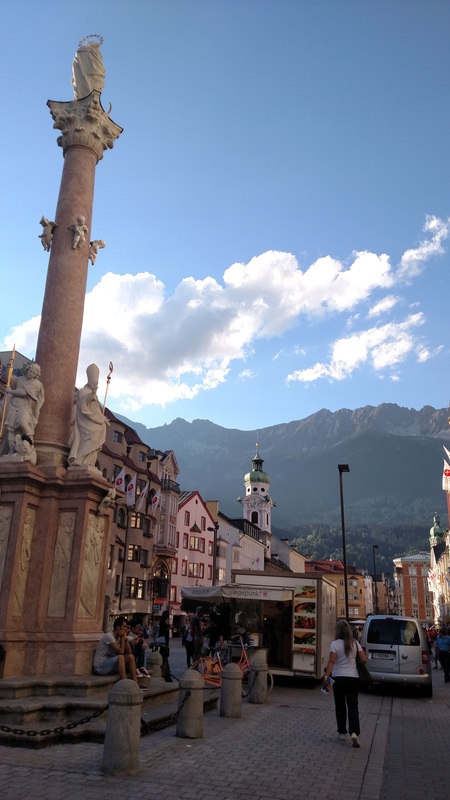 A day in Innsbruck was a nice, quiet way to start ending our adventure. But if you’re into snow sports, I have no doubt that the scenery here would be worth a trip! 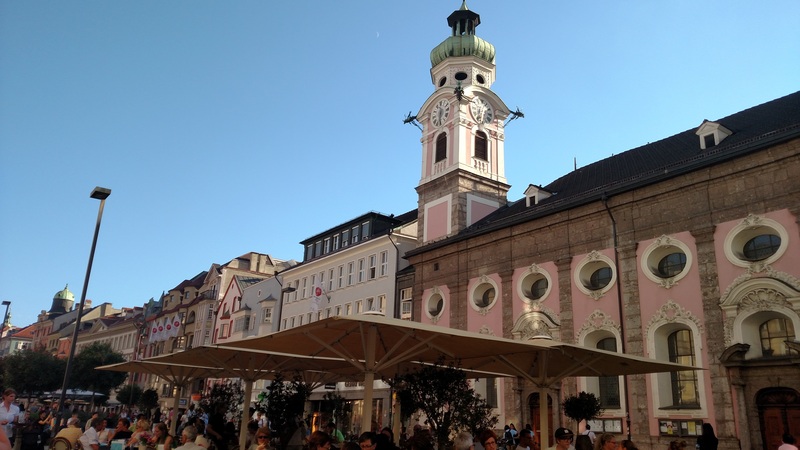 Have you visited Innsbruck? Any favorite spots?